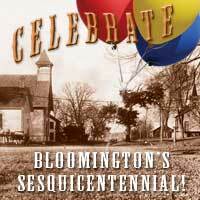 Sponsored by the City of Bloomington, the Bloomington Historical Society and the Bloomington Rotary Club. 11 a.m.-3 p.m. History tours - Bus departs hourly from Washburn-McReavy parking lot . Tours will last 45 minutes. Handouts of 100 historic places. Reservations required, call 952-563-4948. 12:45 p.m. Prelude - Sounds of Silver Flute Choir. 1:05 p.m. National Anthem - Carolyn Pratt, accompanied by the Medalist Band's Flute Choir. 1:10 p.m. Welcome - Vonda Kelly, Bloomington Historical Society President, and Emcee Gene Winstead, Bloomington Mayor. 1:15 p.m. Proclamation - Office of the Governor, Dan McElroy, Minnesota Commissioner of Economic Development. Congressional Register - Margaret Cavanaugh, representing the Office of Representative Jim Ramstad. Old Town Hall Proclamation and Dedication - Mayor Gene Winstead. 1:25 p.m. Recognition of Century Families - Mayor Gene Winstead. 1:40 p.m. History Play - The Beginnings of the Bloomington Township - Gallery Players and Bloomington Historical Society. History Theater Readers - Neil Peterson, Gary Flakne, Susan Anderson, Diane Woebena and Don Stiles. 2 p.m. Roger Hellesvig Presents - Ole Olson, Norwegian immigrant with his trunk. 2:20-3:15 p.m. Traditional Songs and Stories of Irish, Scottish, Swedish, Norwegian and German immigrants - Ross Sutter, Laura McKenzie and Cheryl Paschke. 2:30-4 p.m. Roving Music - The Medicine Show Band. 3:15-4 p.m. Songs and Stories About Early Minnesota - Jack Pearson. Ross Sutter is a renowned performing artist who travels the upper Midwest presenting folk music of several ethnicities, including Irish, Scottish, German, Swedish and Norwegian. Sutter is fluent in several languages and plays guitar and accordion to name a few instruments. Joining Sutter is Laura McKenzie, performing Irish and Scottish music on the flute, whistle and bagpipe. Cheryl Paschke joins Sutter with the fiddle and the Swedish Nykelharpa, performing Finnish, Swedish and Norwegian music. Norwegian immigrant Ole Olson delights audiences, particularly children, as he shares stories of the daring voyage across the ocean from his homeland to America. Olson carries everything he owns in his trunk. 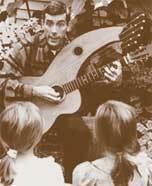 Jack Pearson is a popular children's entertainer, well known for his portrayal of early American music, stories and dance. Accompanied by his "dancing man," a children's favorite, Pearson delights one and all as he plays a variety of instruments. 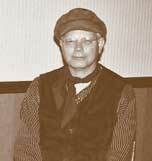 The Medicine Show with the popular Scott Crosbie has entertained people in the metro area for years. Everyone enjoys Crosbie's multifaceted talents as he performs on his rather ingenious washboard/little bit of everything instrument, tap dances and sings with the Medicine Show ensemble.